Next year, Chinese President Xi Jinping will face some of his biggest challenges since taking office in 2013, ones that will test his leadership as never before. They include daunting economic problems, a delicate high-level political leadership reshuffle and the uncertainty that Donald Trump’s presidency is bringing to Sino-U.S. relations. Prior to Xi’s arrival on the scene, the Chinese economy experienced what many describe as an “economic miracle,” decades of strong growth that empowered and enriched the Communist Party. Now, unlike any leader before him, Xi is in charge at a time when the economy is facing a cascading series of problems. They range from mounting local government and corporate debt – which the International Monetary Fund recently warned risks sparking a bigger crisis – to housing market bubbles. China’s economic growth has slowed dramatically (despite being strong by global standards) and there are concerns that, as it moves to cut overcapacity and address the debt problem, joblessness - and in turn perhaps social unrest - could grow. As the economy has cooled, China has sought to grow its influence overseas and investments abroad have surged, so much so that authorities recently stepped in to cool the flight of billions of dollars of capital from the country. Authorities have noted that while China has seen a growing number of billion-dollar deals by its state-owned and private companies overseas, much of the money leaving the country has gone to bogus investments and offshore tax haven accounts. FILE - A billboard shows Chinese President Xi Jinping with the slogan "To exactly solve the problem of corruption, we must hit both flies and tigers," in Gujiao, in northern China's Shanxi province, Feb. 6, 2015. Complicating matters even further, some argue, is President Xi’s choice to put himself at the center of all of the government’s decision making, magnifying his authority to the point that some say he is China’s most powerful leader since Mao Zedong and Deng Xiaoping. Just recently, Xi was given a title that both of those men previously shared, becoming China’s “core” leader. The push for more power was made in part, analysts say, to ensure that reforms move ahead smoothly, but some see resistance growing to Xi and his heavy-handed approach. And now – if and when things go wrong - he is likely to face more criticism. FILE - China's Premier Li Keqiang gestures at the end of a news conference following the closing ceremony of China's National People's Congress (NPC) at the Great Hall of the People in Beijing, China, March 16, 2016. Over the past three-and-a-half years, Xi has rolled out ambitious reform plans, but many remain stalled. And the longer they do, the worse it could get for China’s economy. Xi’s expansive anti-corruption drive, that has targeted more than a million party members, won the central government public support, but led to pushback from local governments. Cabestan says the anti-corruption campaign has created much suspicion in China’s bureaucracy and many officials do nothing instead of pushing through reforms. It is unlikely, however, that China’s paramount leader will have the time over the coming year to address any of those concerns or launch any bold initiatives, says Willy Lam, an expert on elite Chinese politics. Tension is not what Chinese leaders want going into a party congress, the most important event on China’s political calendar every five years. And that is happening in 2017. “This is the year not actually for rolling out new initiatives, but for stabilizing the minds of the public, nurturing consensus and also promoting harmony among different factions within the party,” Lam says. In late 2017, a reshuffle of the party’s top leadership, including the Politburo Standing Committee, will take place. Xi will be up for re-election as party chairman and is expected to expand his control further by weeding out other members who are not seen as being close to him. Whether that will lead to more robust reforms is uncertain. 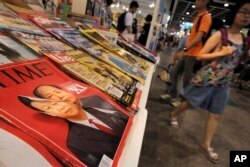 FILE - A copy of Time Magazine featuring portraits of Chinese leader Xi Jinping and former leader Mao Zedong on its cover is seen on display at an annual book fair in Hong Kong, July 20, 2016. Since he was elected, Donald Trump has already shocked China’s leaders, becoming the first U.S. president or president-elect to speak directly with the president of Taiwan, Tsai Ing-wen. He’s also questioned the “One China” policy, a position that was key in the establishment of relations between Washington and Beijing. And that doesn’t even touch on the trade measures Trump says he will pursue in office, ranging from heavy import tariffs to the naming of China as a currency manipulator. Zhang Lifan, a Chinese historian and commentator, says Beijing’s leadership faces serious challenges. He also notes that key members of the World Trade Organization have grown tired of China's communist leaders playing games with the global trade body's rules to enrich the party and expand its political power. And now there is a push to use rules to sanction China. Trump's election raises the possibility that China's economy could face a crisis, slump sharply or even collapse, Zhang says. Zhang says it is possible that Trump’s strategy is targeting the party’s weaknesses and that the ability of China’s top leader to make compromises will be key going forward as Xi looks to maintain his power, the party’s leadership and avoid any disruptive mistakes.